Robotic exosuits are a hot tech topic, and a popular addition to sci-fi movies and television shows. While there’s a lot of great progress happening, most robotic mobility aides and exosuits are still bulky with rigid components and controls. 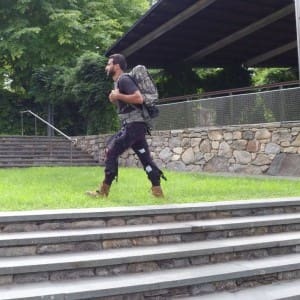 A team of engineering researchers at Harvard see a different future, with smart textile-based soft robotic exosuits that could be worn by soldiers, firefighters and emergency search and rescue workers to help them traverse difficult terrain and arrive fresh at their destinations so that they can perform their respective tasks more effectively. These exosuits could also become a powerful means to enhance mobility and quality of life for people suffering from neurodegenerative disorders and for the elderly. The research team is led by Conor Walsh and is a collaboration between Harvard’s John A. Paulson School of Engineering and Applied Sciences (SEAS) and the Wyss Institute for Biologically Inspired Engineering. The team has been at the forefront of developing different soft wearable robotic devices that support mobility by applying mechanical forces to critical joints of the body, including at the ankle or hip joints—or both, in the case of a multi-joint soft exosuit. Because of its potential for relieving overburdened soldiers in the field, the Defense Advanced Research Projects Agency (DARPA) funded the team’s efforts as part of its former Warrior Web program. “We previously demonstrated that it is possible to use online optimization methods that by quantifying energy savings in the lab automatically individualize control parameters across different wearers. However, we needed a means to tune control parameters quickly and efficiently to the different gaits of soldiers at the Army outside a laboratory,” said Walsh, the John L. Loeb Associate Professor of Engineering and Applied Sciences at SEAS, Core Faculty member of the Wyss Institute, and Founder of the Harvard Biodesign Lab. “These studies represent the exciting culmination of our DARPA-funded efforts. We are now continuing to optimize the technology for specific uses in the Army where dynamic movements are important; and we are exploring it for assisting workers in factories performing strenuous physical tasks,” said Walsh. “In addition, the field has recognized there is still a lot to understand on the basic science of co-adaptation of humans and wearable robots. Future co-optimization strategies and new training approaches could help further enhance individualization effects and enable wearers that initially respond poorly to exosuits to adapt to them as well and benefit from their assistance”. Could Robotic Exoskeletons Achieve Widescale Use by 2022?